No less than eight USB connectors are featured on the back panel, two being USB 3.0 and two eSATA/USB Combo connectors (bottom row, yellow colouring). The GA-890FXA-UD7 also includes dual gigabit Ethernet ports, optical and coaxial S/PDIF output connections, six analogue 3.5mm outputs, 6-circuit and 4-circuit alpha FireWire 400 connectors and a combo PS/2 port for either keyboard or mouse if USB isn't your thing. Moving on to the internal I/O connectors and design, the GA-890FXA-UD7 features seven PCI-Express x16 slots allowing seven separate single slot cards at various links speeds, and support for true 4-way CrossFireX technology at x8 speeds, evenly distributed to every second physical slot; this is due to the majority of video cards using a dual slot design. However, this enthusiast design does come with a shortcoming for some. Due to the extensive array of PCI-Express slots, the motherboard does not confirm to a standard ATX design - it moves to the class of XL-ATX. This limits the amount of cases that can support this case without modification. Thankfully Gigabyte has a list of cases (pdf) that support this case without issues. These include the Lian Li PC- P80/P80R, the Xaser IV and Armor+ series from Thermaltake and the newly released Cooler Master HAF-X. This shortcoming is sure to be less of a problem as case manufacturers accommodate the influx of larger than ATX sized boards hitting the market from a variety of vendors. Looking at the layout of the GA-890FXA-UD7 you will find at the top of the board a neatly placed 8pin EPS power connection, with the 8+2 phase power design hidden under the "Ultra Durable" heatsink. To the right four DDR3 slots supporting up to 16GB of memory in dual channel, 24pin ATX power connector, LED lit onboard power, clear CMOS and reset buttons. On the bottom half of the motherboard you'll find six SATA 3.0 connectors and two SATA 2.0, a debug post code LED display, multiple USB and FireWire headers, one special orange and white USB header for Gigabyte's unique ON/OFF charging system, multiple system fan headers and the most out of place feature for such a board include headers for a Serial port, LPT and existing IDE and Floppy drive connections. 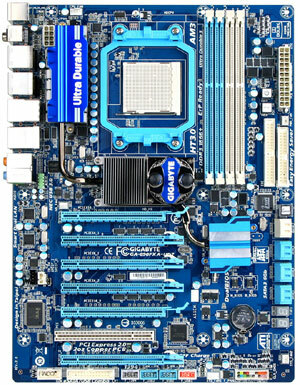 All in all, the board layout is very clean, with all the headers and sockets positioned neatly around the edges of the motherboard. Ultra Durable 3 Technology featuring 2oz copper for a lower working temperature and a reduction of hotspots, better overlocking, better power efficiency allowing electric current to flow with less resistance and enabling more power efficient circuits with lower power loss and less heat generated. Japanese solid capacitors, lower RDS(ON) Mosfets and Ferrite Core Chokes come under the Ultra Durable umbrella. SATA 3.0 and USB 3.0 - AMD's SB850 South bridge provides six native SATA 3.0 storage interfaces with superfast 6Gb/s speeds (great for SSD's) and RAID 0, 1, 5, 10 support without the need for a third party solution. Six SATA ports are SATA 3.0, while the pair in white are SATA 2.0 and controlled by Gigabyte's SATA2 branded controller. USB 3.0 support is provided by NEC's D720200F1 controller due to no chipset implementing a native solution at the time of this review. ATI CrossfireX support for up to four dual slot Radeon GPU's. Thanks to the 32 lanes the 890FX chipset provides, when running four GPU's in Crossfire, each will be fed with x8 links (PCI-Express 2.0); when running two GPU's you will get the benefit of x16. Hybrid Silent-Pipe design provides the option to increase the cooling of the default heat-pipe solution when overclocking and playing with chipset voltages. Not a bad improvement, especially under load. Smart DualLAN with Intelligent LAN port auto-switching allows the system to switch to the second Ethernet connection in the case of one failing. And thanks to the same Realtek chips being use for each Ethernet port, teaming is available for an increase in bandwidth and without the need for an add-in card. DualBIOS - Want to flash your motherboard BIOS in Windows? Scared that you may brick your motherboard? With Gigabyte's DualBIOS solution it's a thing of the past! If something goes wrong during a BIOS flash the system will automatically revert to a previous version stored on the backup BIOS chip without hesitation. Onboard Debug LED display simplifies motherboard troubleshooting and diagnostics without the need for third party solutions. The variety of codes are displayed in the manual and are worthwhile learning when pushing your system to the limit. Onboard Quick Switches - Onboard Power, Clear CMOS and Reset buttons allow for quick and easy tweaking for power users without the need to fiddle around with shorting pins or moving jumpers - the blue LED's look great in a windowed system too! EasyTune6 has been revamped substantially from the previous iterations. It allows you to manage and tweak near every aspect of your motherboard even the ability to unlock disabled cores of processors that support it with a click of a button. 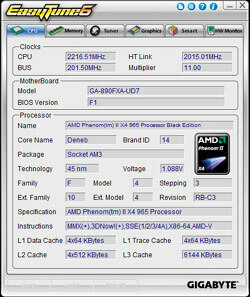 @BIOS is a simple Windows based utility to flash your motherboard. While it's common practice to flash your BIOS via the native Q-flash utility upon boot and not via Windows, this utility allows any user to quickly update their BIOS without the need to find the right download, and the use a bootable USB drive. Thanks to the DualBIOS implemented on this motherboard, the risk of something going wrong has been significantly reduced. ON/OFF Charge Technology provides a set of white and red coloured USB pin headers that can easily be connected to your system's front USB 2.0 ports allowing extra amperage for your iPhone, iPod Touch, iPad to charge correctly. Unlike traditional design Gigabyte's ON/OFF technology will allow you devices to keep charging even while your PC is off or in a variety of standby modes. Other features and technologies include Q-Flash, Xpress Install, Xpress Recovery2, Smart Recovery, Auto Green, Q-Share and Easy Energy Saver support. More details of these can be found on Gigabyte's website.